Easy, no cook salmon tacos. A perfect quick mid-week, assembly only dinner. 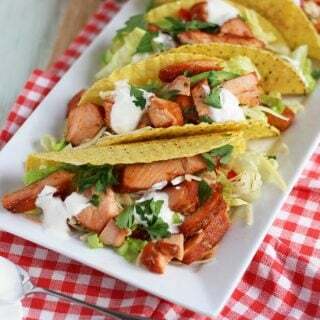 Crispy taco shells, topped with salmon, lettuce, cheese, tomatoes, avocado and yoghurt. 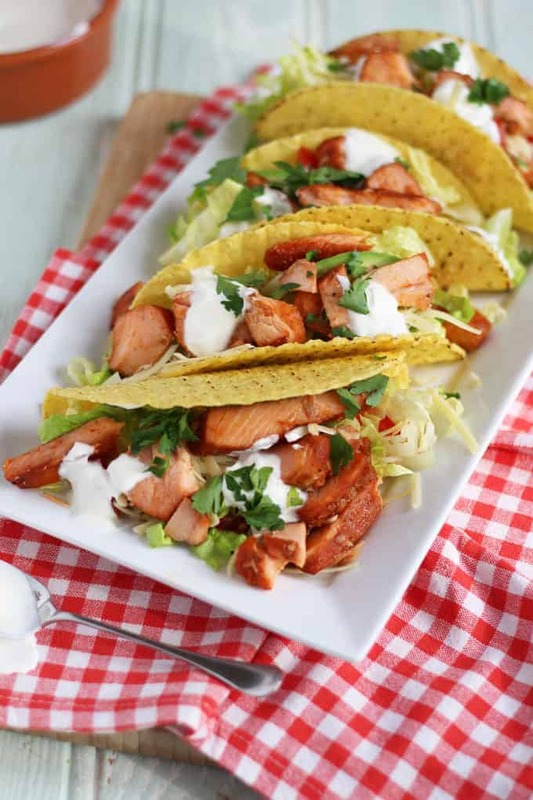 Everyone has busy lives whether it’s running after children, pets, work, the house we all need a quick and easy dinner to keep up our sleeves, well this Salmon Tacos recipe is one of mine. On the table in under 10 minutes, they are so simple and super speedy, absolutely no cooking required. What’s better, George and Harriet can help me make them, which they absolutely love. They can even be delegated to the least domestic, and they still can’t go wrong! They are also a fun dinner to make for playdates as the children can assemble themselves, whilst you rock slowly back and forward in the corner, or is that just me? The most time consuming part of this Salmon Tacos recipe is preparing the ingredients and even then it takes five minutes tops! Firstly shred lettuce, chop some tomatoes, peel and slice an avocado and grate some cheese (or buy ready grated!). To really save time I used ready cooked salmon from the supermarket in this recipe, but you could of course cook your own. Whilst you are chopping your salad heat your tacos in the oven for a few minutes. Now the fun begins, I normally put all of the ingredients in individual bowls so the children can pile everything up themselves. Let everyone dig in building the tacos as they go, ending with the greek yoghurt and grated cheese. Make sure you eat the Salmon tacos as soon as they are filled, otherwise the filling tends to make the tacos lose their crunch. What is the proper way to eat Tacos? Salmon Tacos can be tricky little devils to eat, one false move and your entire filling drops back on to your plate! So the best way to eat them is to firstly line your taco shell with lettuce, then layer your avocado, cheese, tomatoes, salmon and finally some greek yoghurt. 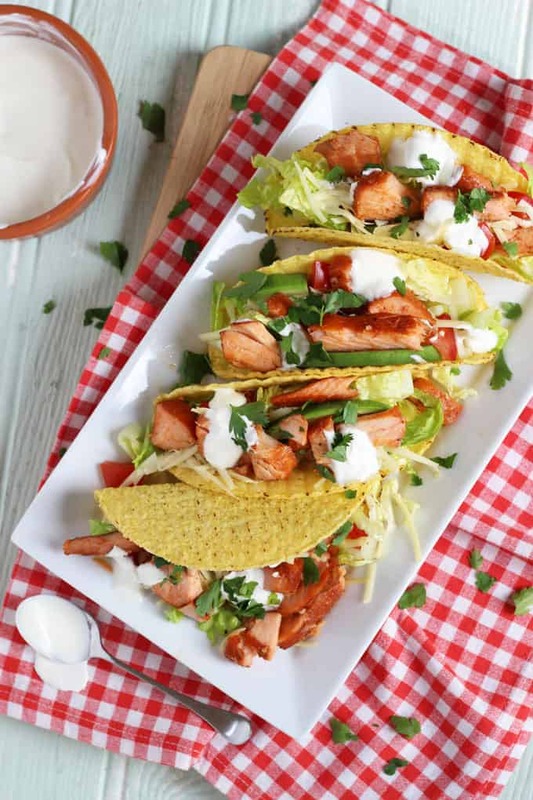 If you do decide to use warm salmon in your tacos then make sure that goes on just before your yoghurt as it will make your lettuce soggy. You need to be careful not to overfill your tacos, the hard tortilla shell will crack on the first bite, so the more filling you have the messier it’ll be! What is a good side dish for Salmon Tacos? Salmon Tacos are best complimented with something light and flavourful. I would serve mine with a green salad, or even a mixed bean salad, with a light vinegarette dressing. Homemade potato wedges would definitely go down a treat in our house too. 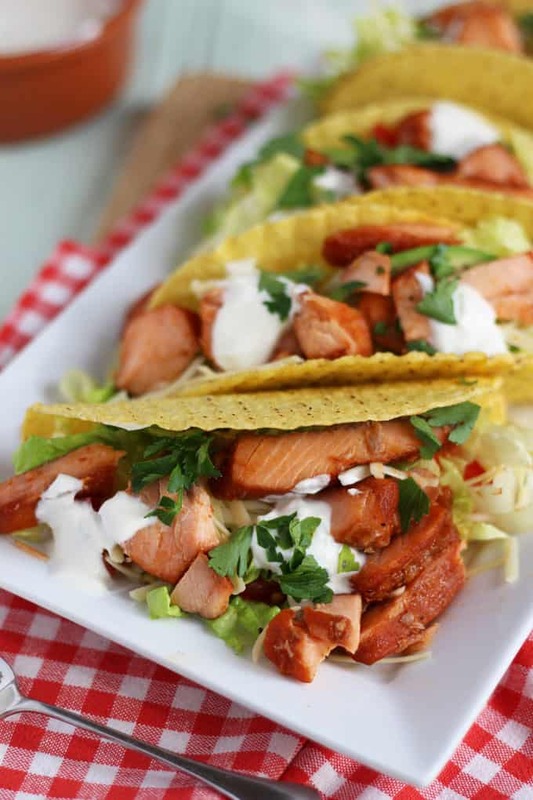 Serve your Salmon Tacos as soon as they are filled to avoid soggy shells! It is definitely better to warm the taco shells in the oven for a few minutes before serving. I used iceberg lettuce in this Salmon Tacos recipe for its satisfying crunch, but you could use whatever you have available, you could even use whole little gem leaves to reduce the chopping time. The world is your oyster when it comes to making Salmon Tacos recipe. You can vary the flavour of the salmon, I’m going to try marinating mine in some curry paste and serving with lettuce, and a homemade cucumber, yoghurt and mint dressing. You could also use plain salmon and varying the fillings to mix and match, a little sweet chilli sauce drizzled on would go down a treat. Once you have mastered the salmon taco you could try cod or a traditional Mexican beef taco recipe. Fancy some other easy fish recipes? How about my Easy Fish Pie or my Homemade Fish Fingers? I also have a Pinterest Board devoted to fabulous fish recipes. Warm the taco shells in the oven according to instructions. Pile up your taco fillings and enjoy immediately! 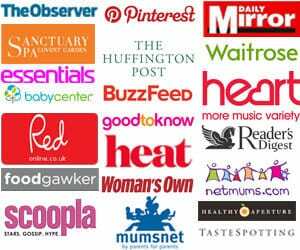 This recipe may contain affiliate links. This means that I may receive a small commission for any purchase you make but it won’t affect the price you pay for the items.